Marketisation is destroying education in our colleges, universities, prisons and the adult education sector. UCU is at a crossroads – how do we get the type of union we need to push back the Tories and the employers in the struggle against marketisation? How can we build and strengthen our union for the fight over pay, pensions and for a progressive post-16 education system? In the late summer and early autumn, both Further and Higher Education members will ballot over pay. And the USS dispute may restart in earnest if the Joint Expert Panel (JEP) finds the projections of the deficit credible. Our union has been transformed by strikes. Over 20,000 new members have joined. Branches have grown – in some cases by 50% or more. All those who care about the future of UCU need to unite and emphasise our needs – for a democratic, fighting union that stands up for its members. 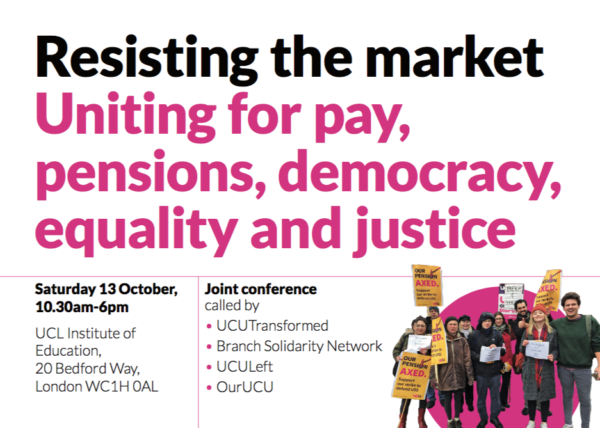 This conference, called by many groups uniting together, is an opportunity for UCU members from across the UK to meet and debate the big questions facing us. Please join us. Registration from 10.30. Conference starts at 11.00.